A group of visual artists who sell their works in the Plaza De La Constitucion petition the elected officials of St. Augustine to consider this proposal . The alliance of artists involved in this proposal feel that open air visual artists contribute to the cultural ambiance of the City. It is imperative that visual art displays protected by First Amendment Case Law be physically separated from jewelry, crafts, cosmetics and mercantile items. minority though they had a “bundle of rights” that went unheard in the din of street performers protests. Case Law will indicate that we may display and sell wherever it is permitted that news vendors sell. Visual Artists exhibit and sell in he section of lower St.George St (ending at Cathedral Place). alongside the Basilica wall and the parking lot wall (Bank of America) facing. Vending stands be no higher than 5´ no wider than 10´´and 3´ in depth. No part of the display may touch any street furniture, wall , trash receptacle or public property. No stand may be placed in front of benches. No stands may be set up within 5 feet of the corner of St.George and Cathedral. Wares other than prints, sculpture, originals, photographs and printed material are disallowed and cannot be combined and sold at this location. While it is recognized by our alliance that the City can regulate time, place and manner in the interests of public health and. safety ,we feel that this proposal in no way hinders pedestrian traffic nor has an adverse effect on the aesthetics of historic St. Augustine. This section is the most unobtrusive half block on the entire street. To the contrary, we feel that this “ Artist’s Row” is a cultural addition to the city, particularly on a block that is now lined with panhandlers exercising their own free speech rights. A first come first served basis is superior to lottery schemes and pre-assigned locations. This is a simple geographic change that does not require the complication of rules. Prints , sculpture, paintings and photographs carry unique and basic First Amendment protections and are readily identifiable. vendors and crafts vs 4 visual artists. It is anticipated that five or six artists will occupy this space at any given time. Since non profit groups ( i.e,The Center For Krishna Consciousness ) are permitted to sell products in this sector, it is precedent that this right also applies to visual artists. 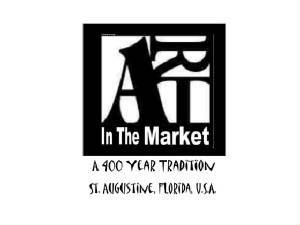 Our alliance of artists are local citizens who share a common respect for the uniqueness and beauty of St. Augustine. It is our contention that we may add to the flavor and European atmosphere of the Ancient City. We respectfully ask that this request for approval and endorsement be received in the spirit that it is submitted. If a Code change is necessary, we petition the counsel to grant us forbearance of the existing code that we may exercise these rights prior to December 15,2006.